This documentation is collaborative: you can edit any page to improve it. GDevelop supports integrating ads into your game using Google AdMob, on Android and iOS. Ads can be loaded and displayed in your game at any time. They can then be displayed as a banner at the top or bottom of the screen or they can be displayed as interstitial screens. Interstitial screens are ads that cover the entire device screen. You can also display reward videos. Banner ads are usually displayed during the gameplay, while interstitial screens and reward videos are displayed after the completion of a level or objective. To get started, go to AdMob website and create an account. Once that is done, you can create a new app and an ad unit. Then, add your application by entering its name and choosing its platform. If your game is for both iOS and Android, you must register two ad units. The first identifier is the app id. The second is the ad unit identifier. Copy these identifiers or keep the page opened, you will need to insert them in the game properties and actions parameters to display the ads. Once you have created your AdMob account and have the ad unit identifier, open your game properties. Open the Project Manager, then click on Game settings and Properties. Try not to be confused between the app id and the ad unit identifier. 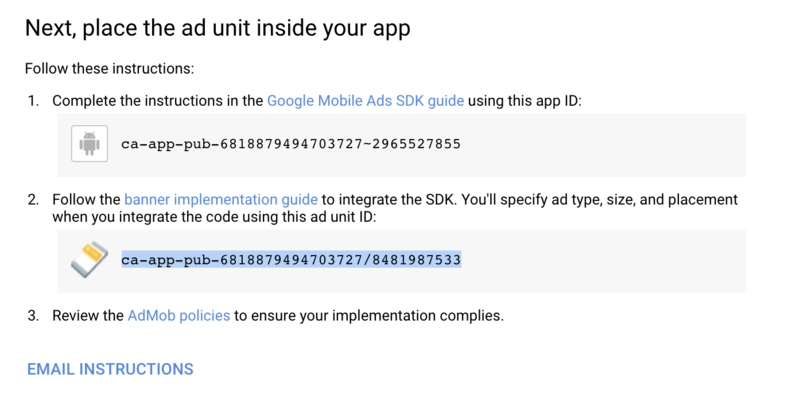 Here you need to enter the app id, which is unique for your app, while ad unit identifiers are different for each ad you're creating. The app id must be entered without quotes. You must choose the action adapted to your ad unit. If you created a banner, you have to use the action to load a banner. Don't forget to set “Display on Load complete” to Yes to have the ad displayed as soon as it is ready. You should start by setting “Test Mode” to Yes to test your ads before publishing your game. You must first build your game for Android (or iOS) to have the ads displayed on the device. Learn more about it on the page about Android and iOS publishing. The one click packaging for Android service included with GDevelop is compatible with Admob, so you don't need any special tooling or development kit to install. You can try the ads and see how they work in a game by opening the example called AdMob. You can replace the app id and the ad unit identifiers in the actions to test with your own account. Try it online! Click here to open the Admob example. You must export to Android using the desktop app to test it on a real phone.